Chinese chip maker appears to be working on two new processors aimed at low-cost tablets… and one new chip which could be destined for higher-performance devices. CNX-Software reports that a product brochure from T-Chip showcasing specs for some upcoming tablets mentions 3 unannounced new processors from Rockchip. The RK3126 and RK3128 processors are both quad-core ARM Cortex-A7 processors with support for 1080p H.265 video and Android 4.4 KitKat software. 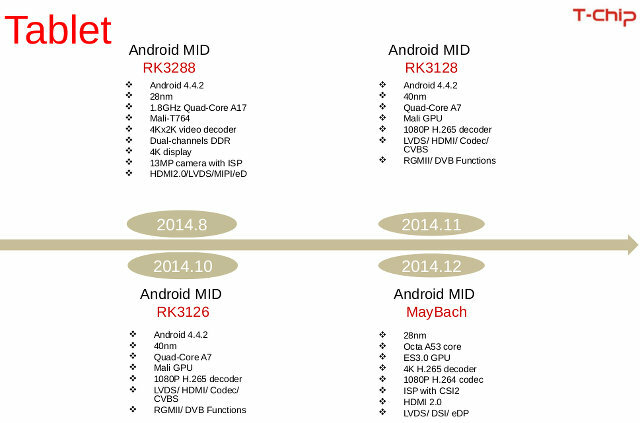 The RK3126 should be available in October while the RK3128 will launch a month later. In December T_Chips expects to launch one of the first products featuring a Rockchip processor with an ARM Cortex-A53 64-bit, 8-core processor. The chip is code-named “MayBach” and it’s a 28nm processor with support for 4K H.265 video playback and 1080p H.264 video. While ARM Cortex-A53 architecture should offer a performance boost, it’s likely that MayBach will still be used in low-to-mid range tablets and TV boxes. The chip is based on ARM’s design for affordable, energy efficient designs. ARM’s Cortex-A57 architecture will be used in higher-performance, higher-priced processors. A53 is replacing A7 and supposed to beat A9 by a bit. A17 is supposed to be some 60% faster than A9 so the 3288 should be by far the fastest out of the 4 mentioned here.. I agree that 3288 will be the fastest, but most likely the highest power drain too (nothing comes for free). While those numbers are accurate the cores are aimed at different clocks and i quoted ARM’s own estimates at slightly different clocks in a bunch of benchmarks for A53. They keep pushing the hardware specs but what they need is better developer on the kernel side.